On August 24, 1818, the Quapaw Line was drawn. Starting at La Petite Roche and heading due south, this line formed the boundary between the Quapaw tribe lands and public lands available for settlement. Though by 1824, the Quapaw were forced to give up all of their lands, the line continued serve as an important marker. In the ensuing six years, the first permanent settlement of Little Rock took place and streets were planned.It is interesting to note that the 1818 treaty referred to La Petite Roche as the Little Rock. Some have speculated that this is the first official use of “Little Rock” to designate the outcropping. When the Post Office was established in March 1820, it was given the name Little Rock. There is a marker commemorating the beginning of the Quapaw Line located at La Petite Roche in Riverfront Park. The first segment of the line is also noted in the park. There are also sunken markers place along the line at various points. In MacArthur Park, at the corner of 9th and Commerce Streets, there is a marker noting that the line passed through at that location. A good account of walking the Quapaw Line through downtown Little Rock can be found on this website. Most of what is now called the Quapaw Quarter was located to the west of the Quapaw Line. However, it did take its name from the fact that the tribe had once lived in that area and was later sequestered to lands near it. The name for the area was chosen by a committee composed of David D. Terry, Peg Newton Smith, Mrs. Walter Riddick Sr., Dr. John L. Ferguson, and James Hatcher. 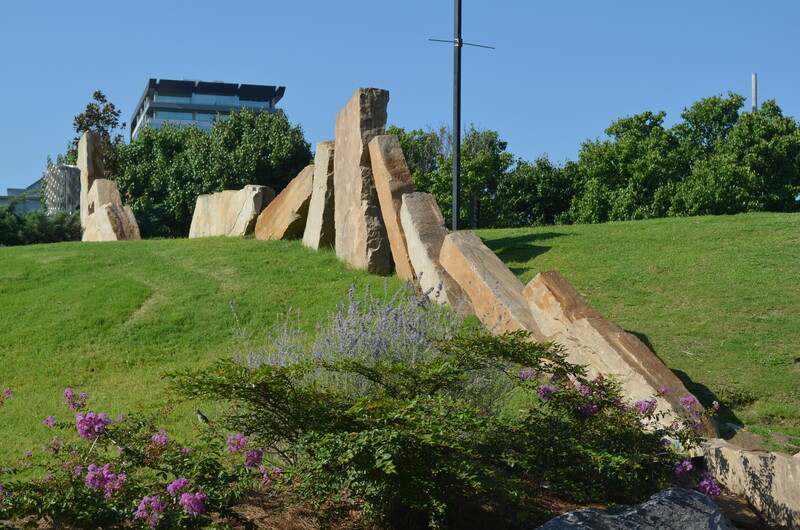 They had been appointed to a Significant Structures Technical Advisory Committee to advocate for preservation of important structures as a component of the City of Little Rock’s urban renewal efforts. This entry was posted in Government, History, LR Look Back and tagged David D. Terry, La Petite Roche, MacArthur Park, Peg Newton Smith, Quapaw Line, Quapaw Quarter, Quapaw Quarter Association, Quapaw Tribe, Riverfront Park by Scott. Bookmark the permalink. I loooooooooooooooooooong heard the actual name ‘QUAPAW QUARTER’ was created by the gentleman who toiled to preserve the old Villa Marre house. (This would have been several years ago.) His first name was ‘JIM’ – alas, I don’t remember his family name. The man may not have been a formal member of this special committee you have listed in your blog, but he obviously was wise in his knowledge and cared greatly about the area. He eventually gifted the dwelling to the QUAPAW QUARTER organization upon his demise.